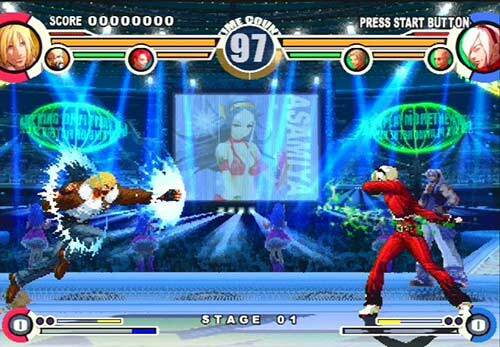 I am still in a state of shock – SNK actually managed to bring the PS2 port King of Fighters XI to America. For a long time we heard nothing even regarding a possibility of release, and, in typical SNK fashion, it was announced and released so quietly that people only knew it was shipping via automated Amazon emails. I think the Fatal Fury and Art of Fighting compilations from earlier in the year got more press coverage than King Of Fighters XI. Rest assured dear readers, the game is here; mostly intact from the Japanese release (we lost online play) and sporting its own beautiful cover art. Part of me is, of course, glad to simply have a chance to play it, but a smaller part wishes it would get the attention it deserves. While not a breakout in every category, the game effectively shakes up the core principles that make King of Fighters what it is. It feels both familiar and new, and it is quite simply one of the finest in the franchise. KOF XI is a product of its time. For most of this century, SNK was in shambles. From about 2000 – 2003, fans were joyous just to learn of a new entry, let alone a quality one. As such this was something of a dark era for King of Fighters. 2000 was a solid game, but still feels a bit weaker in most aspects than its predecessors (possibly because SNK was close to bankruptcy). A shady Korean company called Eolith handled 2001 and 2002, and while each has some fans, most would agree that neither game knows what the hell to do with itself. One tries to experiment a little too much, while the other is almost fearful in its traditionalism. All in all, 95-97 had better stories and 98 was the best “Dream Match” KOF, making everything from this new era almost worthless. And then there was 2003. This one came almost out of nowhere, from a newly revived SNK Playmore. 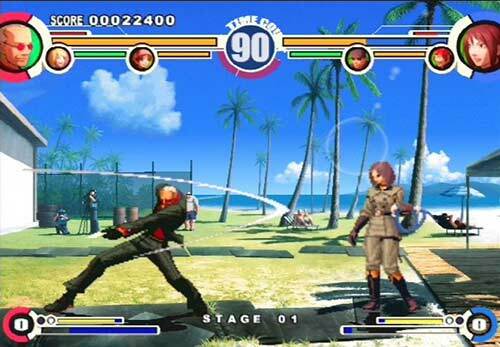 It had its own interesting concept to experiment with; rather than the traditional 3 on 3 team battles of yore, KOF 2003 would sport 3 on 3 tag battles, similar to Capcom’s VS games. This, combined with a new story and heavily modified roster, made it a game worth playing. Unfortunately, the experiment wasn’t a complete success. 2003 has severe balance issues, and, in my personal opinion, the game feels a little too loose and damage from hits is much too great. In some ways it feels like a solid production, and in others it just seems off. At the very least, it was a sign that SNK had future plans for the series, and after 10 years it was ready to try something else. They decided to continue the new story, as well as the tag battle system. They would do away with yearly entries and take as much time as needed to produce a sequel. It was in this environment that KOF XI was produced. The result is a fighter that feels like the logical progression from 2003. It has the same ideas, just fleshed out more. The roster has seen even more changes. There are quite a few new characters, such as the popular, card-wielding Oswald, older favorites like Eiji, and more still more characters from Mark of the Wolves. It leads to some very interesting setups; the Fatal Fury Team now consists of Terry, King and Duck King, a combination so awesome that my brother and I have named it “The Ultimate Team.” Thanks to 2003’s story putting Chiziru out of comission, old rivals Kyo and Iori are forced to team up with Shingo, a combo that seems so logical yet so out of whack that it takes its spot as the second most interesting team. The rest of the characters are placed into mostly logical groups, though, like 2003, not all of the teams make sense. Just like it seemed pointless for Gato to team up with Yamazaki and Billy Kane in ’03, I don’t understand why he would team up with B. Jenet and Tizoc in XI, save for the fact that each of them are from the same game. The same question goes for why Blue Mary would side up with Vanessa and Ramon. As the King of Fighters universe continues to grow, it seems SNK is concentrating storylines on a few key teams, while being content to group the rest of the characters up by series or personality trait, but there used to be a time where every team had a reason to be together. The tag system is significantly more complex, and it is now clear what SNK had in mind when they started it. Team Leaders still have their own special super combo, but this time they feel even more important, because many characters have had their most powerful or useful Super designated as their Leader move. Whether or not Ralf has his Galactica Phantom can be a big deal for certain team configurations. The biggest change comes in the Skill Point system. In addition to the Super Meter, a player can stock up on Skill Points during the match. These are what must be spent to perform certain tags. Under normal circumstances, you can tag in and out at any time, but this is slow and leaves you vulnerable (unlike Marvel VS Capcom 2, incoming characters don’t launch a powerful kick as they enter the screen). By using Skill Points, a player can safely tag out when blocking or being pushed back by an attack. They can be used to perform Quick Shifts during a combo, which not only bring in a new character, but allow them to finish a combo (if used correctly, this has the potential for major damage). Skill Points are also used when you want to cancel from a special move into a Super (or a Leader Move). What Skill Points do is put a fresh spin on the old concept of tagging. Games like Marvel VS Capcom 2 had it all – assists (which were the inspiration for the Striker system in older KOFs), mid combo tags, and relatively safe tagging. This is all a little too offensive-minded for King of Fighters however; if you could freely cancel between supers, you could finish off someone in no time. In KOF XI, tagging involves a great deal of strategy. Do I save those Points for a nasty combo? Or should I save them in case I need to tag in a more appropriate character for this matchup? Tagging makes it so that there are no longer sacrificial members of the team, and also makes team composition even more important, as certain Quick Shift setups are highly effective. Like everything else in the game, tags have to be thought out to be effective, and it adds a pacing you might not expect from this series. This is why the game is so very good; we already have a few games that do traditional 3 on 3 fights very well. XI puts all of our familiar characters and strategies into new situations, giving us new options while changing old ones. XI is also notable for being more forgiving with its fancier techniques. Inputs for complex moves feel less strict, and since only certain moves can be used during Dream Cancels, they are fairly easy to perform, as most of them were set up so that the inputs for each move flow well between each other. Forgiving is still a relative term. More than any other game of recent memory, KOF XI points out just how hard it is for a novice player to get used to the timing and strategy that is required for higher level play. This is thanks to the game’s console exclusive Challenge mode. Like similar modes in other games, Challenge mode consists of battles with certain stipulations. The difference is that completing many of the levels requires at least a basic grasp of the game’s concepts. Some may be made easier by certain characters, but several of them will require you to pull of Quick Shifts, Dream Cancels, and sometimes both. The challenges aren’t guaranteed to make you master each game mechanic, but they will at least make you familiar with them, so that next time you try to practice, you have an idea of ‘what’ and ‘how’ you should execute. Challenge Mode also unlocks a few console exclusive characters, so it is quite the useful “tutorial”. The one area where KOF XI may disappoint is presentation. The best way to describe it is conservative, resulting in a fighter that won’t offend, but won’t amaze either. The nicest thing to see are the menus, which are simple and elegant, as well as feeling quite integrated. It gives the impression that some actual care went into this port, and is much nicer than the usual barebones menus and interface. The new Atomiswave arcade board is used to make some clean and detailed new backgrounds, but none of them feels particularly inspired. I can draw a parallel from some past fighting game for each of them. The sprites, on the other hand, have yet to be redrawn (aside from the new characters, who don’t look better). You can play around with some visual settings, but no matter what they will still probably clash with the much improved stages. The soundtrack is good enough for the purpose of background noise, but it isn’t exactly memorable. What we have feels good enough, but you also know it could be better. 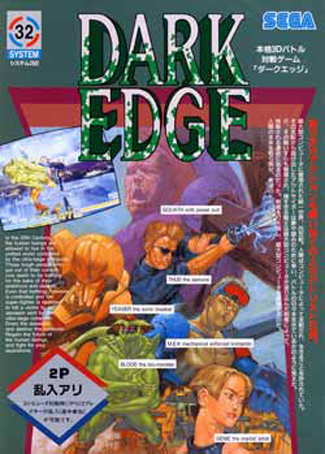 Older KOFs on the Neo Geo managed to pack in tons of details and animations for stages that felt very lively. They also had some classic tunes. In this day and age even doujin fighters are starting to use hi-res sprites. After a few years of dismal presentation, let’s just settle for what we have here, but hope that 12 ups the ante. Also, it seems that there is no support in this game for Progressive Scan. I have heard some complaints about this, but then again, it isn’t a feature the majority of PS2 games support. King of Fighters XI will probably not entice people to check out fighting games any more than they used to, but it is one of the strongest entries we have seen in the entire genre in 2007. There is so much to do here that it will easily keep us occupied until the release of 12, and it also gives me hope that 12 will improve by even greater leaps and bounds. With 3d fighters in shambles (Virtua Fighter is the only series that seems hell bent on improving itself) and Guilty Gear apparently dropping out of the genre, we need something to step up and challenge the industry. 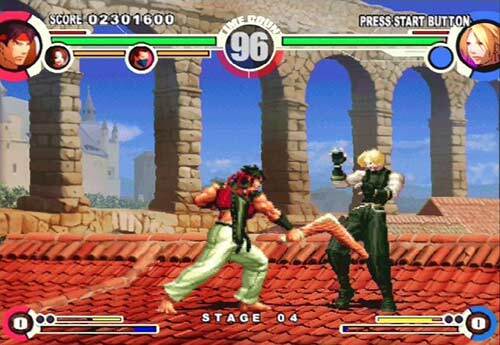 Of course, we all know that this will be a job accomplished by Capcom and its blitz of new Street Fighter games, but if SNK can get halfway there with a revived King of Fighters, then we could be in the midst of another Golden Age. SNK needs our support, and KOF XI is the game to give it to. I haven’t had this much pure fun with a fighter since Third Strike, and for once I am excited for the future, as opposed to being merely curious.